A few years back I had a friend help me out when I was hosting a dinner party. I say “dinner” in the loosest of ways, because actually it was a grazing style, lots of appetizers and hor d’oeuvres party. I made a few things, she made a few things, and together we cooked all day. We had as much fun prepping as I did at the party! Anyways, one of her recipes was a huge hit and I knew I needed the recipe. Thankfully she gladly shared it with me and I’ve made these Peppered Pork Sliders w/Caramelized Onions many times since then. Isn’t that really what recipes are all about? Sharing them with family and friends and hopefully handing them down for generations to come. This dish is a little time consuming because you need to Caramelize the Onions which takes some time, but please do not let that deter you. In fact, make this dish on a weekend and “if” you have some onions left over you can use them up the following week. How about topping a burger with them, making some homemade Onion Dip, or dumping them in a pot of homemade soup. I also wouldn’t hesitate to add them to a pasta dish or this Potato Breakfast Bowl. Can you tell that I’m a fan of leftovers?? I should add that the only way I’ve enjoyed this Peppered Pork is as a slider, however, it would be a delicious dinner served with a side of mashed potatoes or simple buttered noodles and a salad or veggie. The pan dripping would make a delicious gravy! Caramelize your onions by placing them in a large skillet with 2 TBSP olive oil and 2 TBSP butter. Cook over med/low heat for at least an hour, stirring regularly *please see linked post. Dry rub the pork roast with the sugar & salt, place into large zip baggie and let sit for at least 1-2 hours (overnight is ok). Crush the peppercorns with mortar/pestle, a spice dedicated grinder, or use a large grind from your pepper mill. Rub the meat with the peppercorns. Save what doesn't stick to add to marinate. Melt butter in small pan over med/low heat. Add garlic, vinegar, thyme, and remaining pepper. Preheat a large cast iron or other oven proof skillet on stovetop to med/high. Add oil. Season the meat with a little salt and place into hot pan. Quickly brown all sides of pork. Thinly slice your pork loin. To prepare sandwiches lightly grill/toast rolls with a little butter. Prepare some Sriracha mayonnaise (to taste). Layer toasted roll, mayo, a few thin slices of meat, and some caramelized onions. I love sliders, and pork is a real favorite around here. This looks delicious! I especially like the idea of the caramelized onions. I can see why these were a huge hit! They look amazing! Sliders are the best! I am adding this to our dinner menu lineup…they look fabulous! Pinning! Oh wow. Drooling here. Your photos are beautiful and definitely make me want to try this! My husband is a huge fan of pork sandwiches. I’m making these this weekend! Wow, those look good. I bet the grilled onions and Hawaiian rolls really add something special to the sliders! Oh my gosh, the toasted Hawaiian roll and grilled onions are SO good with the pork. 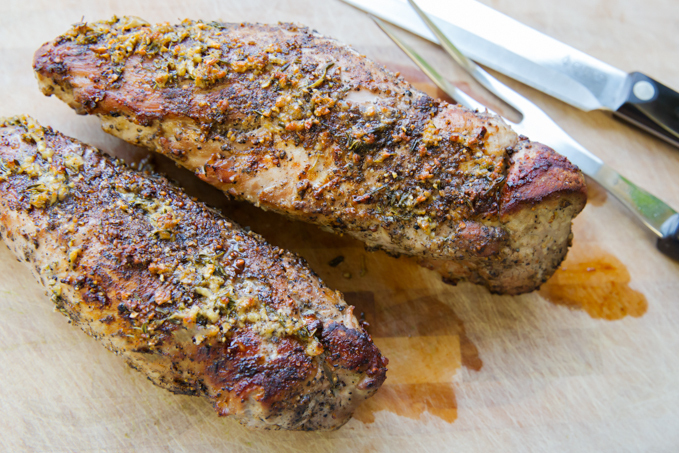 Gorgeous peppered pork! I could eat this seven nights a week. And those caramelized onions….oh my. I just wrote “pork loin roast” on my shopping list, thanks to you! These sandwiches look like the perfect game day food, and they’re so easy to make, how can I resist? Grilled onions are among my favorite things. These look so tasty. Your photos are gorgeous Renee! And this recipe looks amazing. I love the caramelized onions! 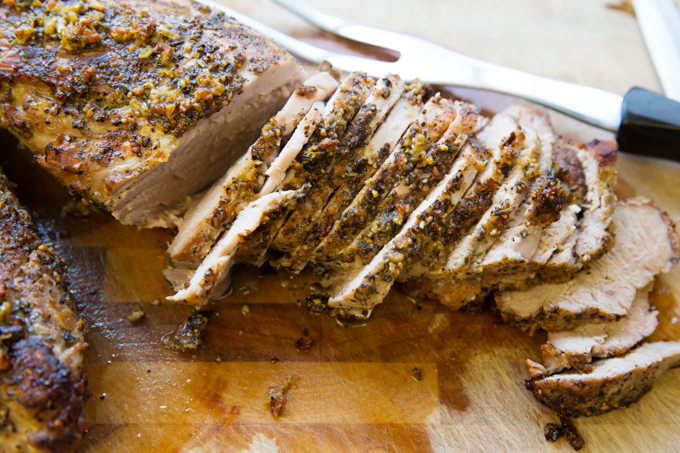 Oh my gosh that crust on the pork loin is just PERFECT. What a delicious slider! 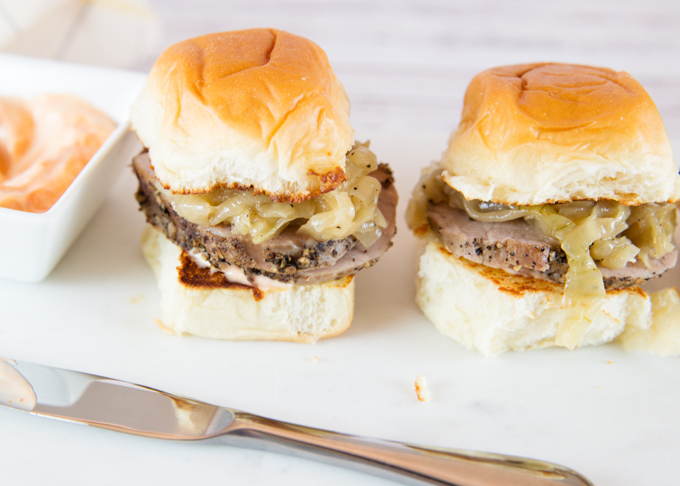 These peppered pork sliders would be a bit hit on our game day events. We all love pork. This look fantastic! 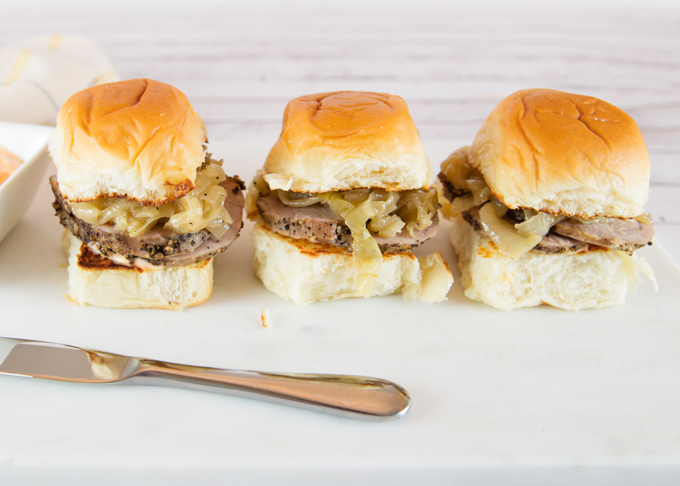 Caramelized onions are so worth the time to make them – these sliders sound delicious! Receive calls for pork loin but in the photos it looks more like tenderloin which at 3-1/2 pounds would be about three pieces. Which is it? The original recipe, passed on to me from a friend, is as written. I purchased a two pack of tenderloins, which was probably in the 3 1/2-4 # range.